Toastmasters International is a worldwide network of clubs where people develop their communication and leadership skills. The Toastmasters clubs of Belgium and Northern France are united in Division B, which is part of District 59, covering Belgium, France, Luxembourg, Netherlands and Monaco. In a proven educational programme, Toastmasters members learn to give better speeches and presentations through mutual feedback. The confidence they gain on stage helps them to become confident leaders. Toastmasters helps you to become a competent communicator and a confident leader. If you are looking for a warm and friendly atmosphere in which you can improve your public speaking competence and grow your leadership skills, Toastmasters is definitely the place to go. Find a club near you: they will be delighted to welcome you as a guest. 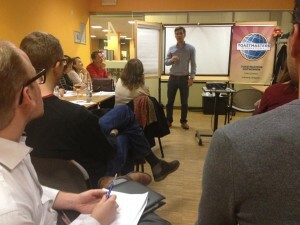 Attend a meeting for free: it’s the best way to discover what the Toastmasters concept can mean to you!